Give Tue UC Merced is coming Tuesday, Nov. 28. 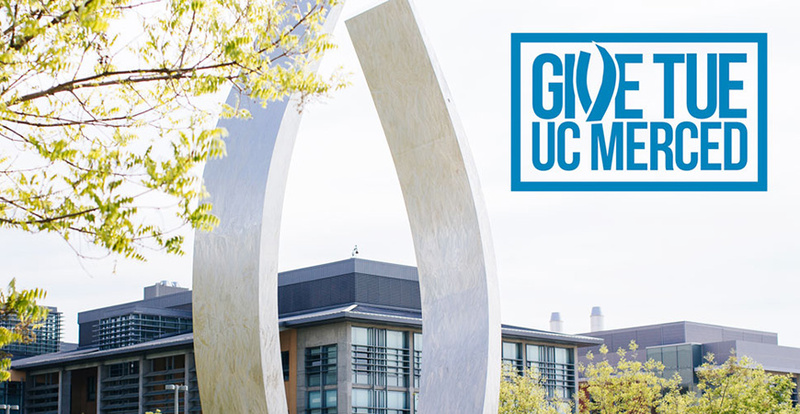 The annual day of giving at UC Merced — Give Tue UC Merced (#GiveTueUCM) — presents many opportunities for donors to help students and programs. Every opportunity is equally worthwhile because #GiveTueUCM is ultimately about supporting student success, but everyone has their favorite causes. For Vice Provost and Graduate Dean Marjorie S. Zatz, that favorite cause is one that is very close to home. She is hoping to convince students, staff, faculty and alumni of the importance of giving to graduate education at UC Merced. Zatz is offering a match of $10 for every donor who directs a gift to the Graduate Student Fellowship Fund during this year’s Giving Tuesday event, up to a total of $1,000. Gifts to the Graduate Student Fellowship Fund directly support graduate student research and can be instrumental to degree completion. UC Merced Foundation diplomat Jane Binger, Ed.D., and her husband, UC Merced Foundation Trustee Robert Bernstein, M.D., are joining Zatz in offering matching funds. Binger and Bernstein will add $25 to the first 40 donations of any amount given to the Graduate Student Fellowship Fund on Giving Tuesday, up to a total of $1,000. They hope their gift will encourage others, including current students and their families, to begin the tradition of giving to UC Merced early and often. Zatz, Binger, and Bernstein are passionate about supporting graduate education because they know graduate students and their work are integral to the UC Merced mission. Graduate students are vital to faculty research projects. They also teach courses or act as teaching assistants in larger undergraduate courses, and, of course, they pursue their own original research projects. With all those responsibilities, there isn’t much time left over for worrying about finances, but budgets are always tight for graduate students. Fellowship funding can significantly affect a graduate student’s progress toward his or her degree. Without that funding, research projects can stall and student outcomes suffer. Zatz sees her matching gift as paying it forward to the graduate students at UC Merced, and she likes the format of Giving Tuesday because it encourages donors to give whatever amount works for them — from $5 to $5,000 and anything in between. Binger and Bernstein, who are ardent and generous supporters of UC Merced graduate students, also gave $15,000 to support UC Merced’s Grad Slam competition earlier this year. In addition to the fellowship fund, gifts can be made directly to the Graduate Division to help cover the costs of professional development and other supplemental programming and initiatives that greatly increase students’ ability to complete their degrees and be competitive in the job market. Giving Tuesday kicks off at midnight EST Tuesday, Nov. 28, and ends at 11:59 p.m. PST. As in years past, there will be an on-campus giving headquarters — GIVE TUE HQ — on the first floor of the Kolligian Library for people who want to make their donations in person.